Worship is where the Spirit gathers a people of Hope. Join us in Dimnent Chapel! Chapel Services: Monday, Wednesday and Friday, 10:30–10:52 a.m. Gathering Services: Sunday, 7 p.m.
We gather to worship the Triune God of grace. This God is the subject and object of our worship because God is the source of all things good and true and beautiful. We seek to worship God with all our strength and all our joy. 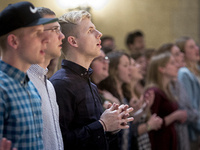 In Chapel we sing the songs of the faith, we pray in the name of Christ and we listen to Holy Scripture. Every Sunday we gather to be fed at Christ's table. Worship is where Hope gathers.